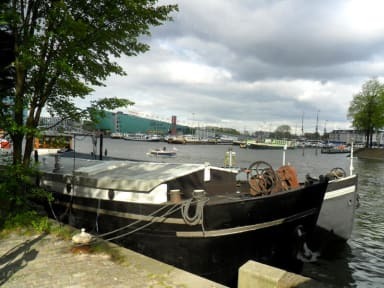 Anna houseboat is a large converted cargo ship from 1907. Moored in a unique spot in downtown Amsterdam. Recently upgraded to modern standards, but still looking classic, with lots of original features. Overlooking the old Harbour with its ships in all shapes and sizes. Come, and enjoy the gentle sway on the waves from the boats passing by. The large fully equipped kitchen can be used by all to prepare your own breakfast, making dinner or use the computer. Free internet, tea, coffee, etc provided. The large bathroom with shower has all necessities like hair-dryer and iron. 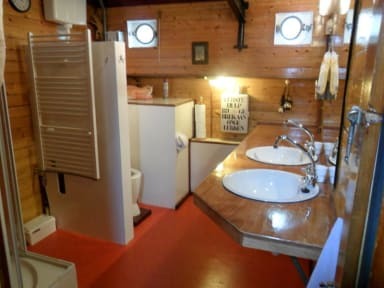 The bathroom and 2 toilets are to be shared. The deck and dock can be used for sitting outside and BBQ. There is a terras on the roof. You will get your own keys, so you can come and go as you please. The owners, Thijs and Dawn, live in the aft of the ship, and will be happy to explain and answer any questions. Check-in from 13:00 hours. You can leave your luggage from 9 am, when you arrive early. Please inform us of the time of drop off if you are planning to do so. Check-in from 13:00 hours. You can leave your luggage when you arrive early. We accept Credit cards, (Visa, MasterCard, Vpay, JCB, UnionPay), and debit cards with the Maestro logo. A surcharge of 2,5% applies to all card payments. Free coffee and tea are provided. Breakfast is not included, but we do provide all basics. You only have to buy your own bread, milk, etct. All taxes included, no extra charges.